One of the main features of primaERP BILLING is the possibility to create bills for your clients, which in addition to TIME TRACKING expands your possibilities in a great way. 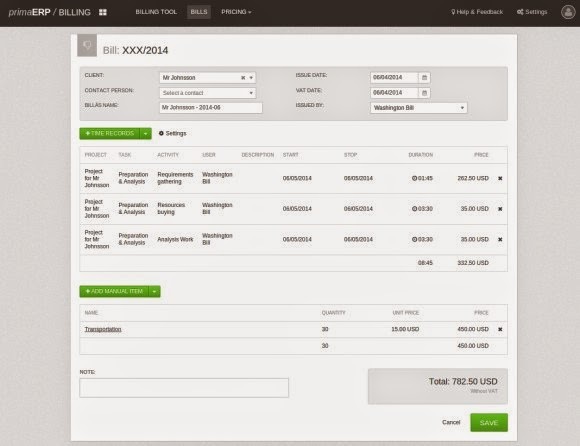 You can now easily transform all the time you track in TIME TRACKING into money on a bill. 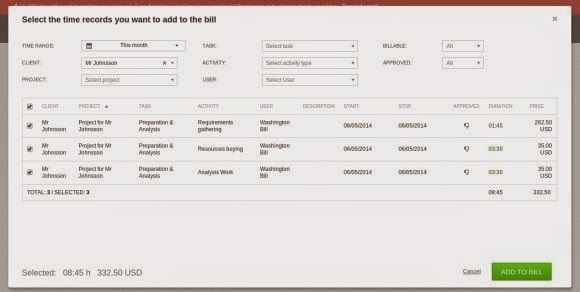 You can create bills either by going through the billing tool (see more on our Billing Process post) or simply by clicking on the “Bills” option in the upper menu and then hitting the “+New Bill” button. The bill itself resembles a piece of paper, so you can already envision the final result. You can select a client and then start filling in your bill with the rest of the data. You can add time records, which are taken from the primaERP TIME TRACKING module by hitting the “+ TIME RECORDS” button. If you don’t want to add those time records, there’s an option of adding your own items, a thing we call “Manual Items”. The process is very straightforward: just hit the “+ ADD MANUAL ITEM” button and you could be adding fixed or custom expenses that are not present in your time records data but will be billed to your client. The possibilities are endless. Once you’re done building your bill, you can just save it, print it and you’re ready to send it to your client. All your bills are to be found in the list under the “Bills” menu. As soon as they are approved by the client, you can simply go and set their status as such (and in this way, mark it as complete). We hope you take advantage of this new feature and we’re definitely looking forward to hearing back from you, so that we can continue to improve it. Go on and start billing today!